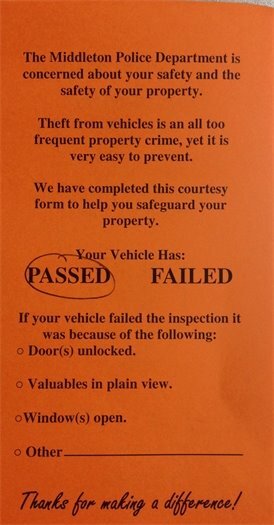 Have you ever found one of these orange "Vehicle Security Report Cards" on your vehicle when you wake up in the morning? 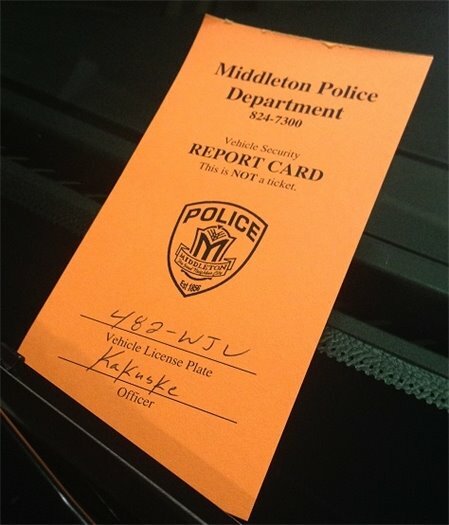 For the past several years, Middleton Police Officers have been randomly spot checking parked vehicles and placing this “Vehicle Security Report Card” on vehicles as a courtesy. This is NOT a ticket and there is no need to contact the Police Department if you receive one, it will simply be marked if your vehicle PASSED or FAILED based on susceptibility to theft. Theft from vehicles is an all too frequent property crime that often involves unlocked vehicles and is very easy to prevent. Help us help prevent crime in Middleton. Lock it or lose it. If you see something, say something. Reporting suspicious activity as soon as you can safely, could help prevent you and your neighbors from becoming the next crime victim.